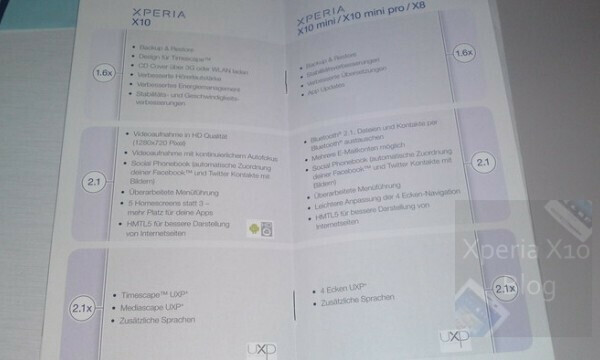 Just when things were starting to look rather stale on the software side with Sony Ericsson's line of Android powered Xperia smartphones, out of nowhere comes a purported leaked road map showing updates for the devices. The document itself is in German and is said to come directly from the IFA event held last week in Berlin – which naturally holds some juicy details regarding Android updates. For starters, the Sony Ericsson Xperia X10 is looking to receive its dose of Eclair which will provide noteworthy items such as 720p video capture with continuous auto-focus, HTML 5 support in the browser, a total of 5 homescreens, and the integration of Facebook and Twitter with your contacts. Other devices like the X10 mini, X10 mini pro, and X8 will also be a part of the Android 2.1 Eclair eating club which will tack on things like an incremental change in the four corner navigation and Bluetooth 2.1. Moving past all of the Android 2.1 news with the X10 handsets, it looks as though Sony Ericsson is planning on doing something with 2.1x which is alleged to offer an improved UX platform to both Mediascape and Timescape. Sure it's nice for current handset owners to know that Eclair will spruce things up for their dated Android 1.6 experience, but there is no mention in the leaked document regarding any hints of Froyo for any of the smartphones. Additionally, there is no time frame on when we'll be seeing these updates begin to roll out. no hints of froyo? it a one page shot, flip the page to see what comes after 2.1x.